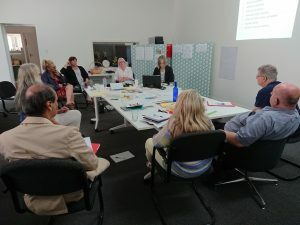 The Trust seeks to support the ongoing development of Program Coordinators and Board members in a number of ways, including via the regular meetings that boards and staff hold. These include “Network Meetings” and the “Citizen Advocacy Study Group”. The Study Group is of particular interest to the Trust because it aligns with the Trusts purpose of building a solid base of sound Citizen Advocacy practice consistent with the Citizen Advocacy Model. The meeting agendas singularly relate to specific CA Office practices that enhance the creation and support of CA matches, board conduct and coordinator practices and attributes. These meetings do not at all discuss matters related to funding, government policy and the like. Study Group members commit to the study group’s purposes, even if they are unable to attend. But all sessions are recorded and study group members have ongoing access to these recordings so they can use them as an ongoing reference pointThe Study Group was instigated by Mitchel Peters, a past coordinator of the Perth East CA program who has had a continuing involvement in teaching and writing about sound CA practice. He has been assisted by several other coordinators and board members. The two day meetings have occurred twice a year, with six having being held at the time of this newsletter. 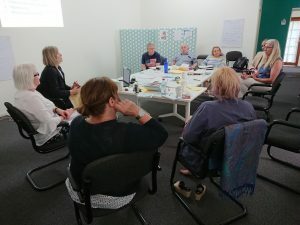 Study Group Members report that these sessions offer an enormous foundation for making sound matches and in building a network of support and advice to each others practice. For the Trust, the Study Group constitutes one of the strongest ongoing projects for building Citizen Advocacy practice in this country. We look forward to maintaining an ongoing association with both the Study Group and the Network Meetings as they continue to be build excellence in Citizen Advocacy capability.